A Piece of Work ← You Want Me To Wear What? From the waist up, I love this dress. I love the placket of buttons and the ruching along the waistband. I actually don’t even mind the fact that it’s blue velvet. From the waist down, though, that’s a whole other story. Those ruffles start, and the widest part of my body somehow manages to become twice as wide. I can only look at that and imagine myself trying to squeeze by someone at a crowded gallery, and, in the process, knocking over everyone in the vicinity. It would be comically, grotesquely large. What starts as an interesting take on a classic silhouette becomes an 80s prom dress. And strangely, I hate the blue velvet with the ruffles. 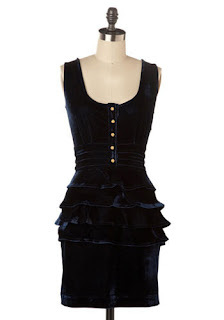 So, designers, take note: blue velvet with button plackets good, blue velvet with hip ruffles, bad.